How exciting can a sheep farm possibly be? Carey Mulligan as "Bathsheba" and Tom Sturridge as "Sergeant Troy" in Far from the Maddening Crowd. Directed by Thomas Vinterberg. With Carey Mulligan and Matthias Schoenaerts. Now playing. Blame it on Jane Austen and Merchant Ivory. Not that the author of Pride and Prejudice and the filmmaking team of James Ivory and the late Ismail Merchant deliberately set out to ruin the costumed English-language romantic drama as a movie subgenre — but that was the net effect. Austen's adaptors were so good at what they did — alongside the adaptations of other authors' works by Merchant and Ivory — that together they virtually invented the modern "coffee table movie." That curious combination of over-decorated settings, lush wardrobe, and, above all, the spectacle of quaint folks from another century courting each other over tea, carved out such a distinctive niche that it became an instant cliché, easy to parody yet resilient in its popularity amongst a slim demographic pie slice of fervent fans. Merchant Ivory's A Room with a View (1985) begat Ang Lee's Sense and Sensibility (1995) begat Northanger Abbey (2007), culminating in Jerusha Hess' 2013 Austenland, the funniest of numerous comic riffs on Austen-mania. The phenomenon became ingrown and slightly ridiculous. Tea cozies ran amok. The sad result of so many coffee table romances is that they've spoiled the prospects, at this late date, for anyone else who wants to take a whack at source material involving bonnets, wellingtons, and unrequited love. Fortunately Thomas Vinterberg, director of a new version of Thomas Hardy's Far from the Madding Crowd, is undeterred by the traffic jam. This particular Victorian literary adaptation is good enough to restore credibility up and down the line. Over and above the fact that Hardy (1840­–1928) is a more interesting writer than Austen, filmmaker Vinterberg and screenwriter David Nicholls (who adapted Great Expectations for Mike Newell) have a crackerjack cast at their command. Carey Mulligan stars as Bathsheba Everdene (no relation to Katniss), a willful and beauteous landlady raising sheep and grain in Southwestern England's county of Dorset, circa 1870 — the sort of woman who's determined to perform every task better than a man. When Bathsheba inherits a much larger farm, her fair figure and assertiveness attract not only the muttering of the local farmers but a trio of suitors. The first and unlikeliest of these is the aptly named Gabriel Oak (Belgian actor Matthias Schoenaerts), her brawny, plainspoken foreman, who proposes they pool their individual work ethics and make hay together. Bathsheba is intrigued at the suggestion but withholds her decision. Next up is William Boldwood (Michael Sheen), a rich country squire living in a grandiose mansion, who nevertheless carries a palpable air of melancholy. His proposition — to hitch up and thus double the size of their operations — is more of a business deal than a declaration of love, in keeping with the mercantile spirit of the times. Boldwood, too, is gently rebuffed. The suitor who truly dazzles Bathsheba is Frank Troy (Tom Sturridge), a dashing, impetuous British Army sergeant fond of swinging his saber at country fairs. That's not all that Troy has been swinging. Whimpering on the sidelines is Fanny Robin (Juno Temple), a poor, rejected young lass now pregnant with Troy's offspring. Each actor personifies her or his character seamlessly. It's as if we're magically witnessing a documentary fleshed out with believable types. Vinterberg, the Danish international director of The Hunt and It's All About Love (and one of the original Dogme filmmakers), takes full advantage of some eventful and picturesque set pieces (sheep driven off a cliff, a disastrous fire, a bare-knuckles boxing match, stirring renditions of English folk songs, etc.) as well as his thoroughbred cast. Mulligan is especially fine as the matter-of-fact Bathsheba, who keeps most of her thoughts to herself, except for the occasional tête-à-tête with her servant, Liddy (Jessica Barden, Saoirse Ronan's playmate in Hanna). 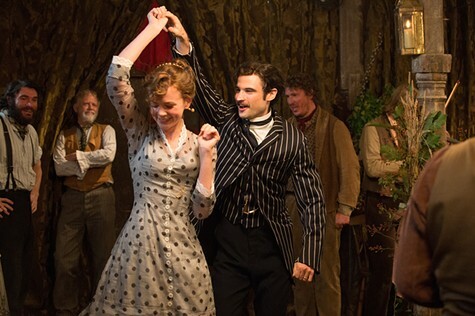 Far from the Madding Crowd overcomes its ripe visuals and familiar story line with straightforward, actorly style. It deserves to stand alongside the John Schlesinger-Julie Christie-Peter Finch-Alan Bates-Terence Stamp version from 1967. Vinterberg's classically minded mini-epic successfully drags the coffee table picture out into the sheep pen and gets it dirty. And bodices go unripped.